This is an initial summary, written in the 100th year after his passing, of events in the life of Thomas B. Kennedy of Vermont who gave 3 and ½ years of service in support of the Union cause during the Civil War. He was a first-generation Irish American, the fourth of 6 boys in a family of 14 children, 11 of whom lived to adulthood. 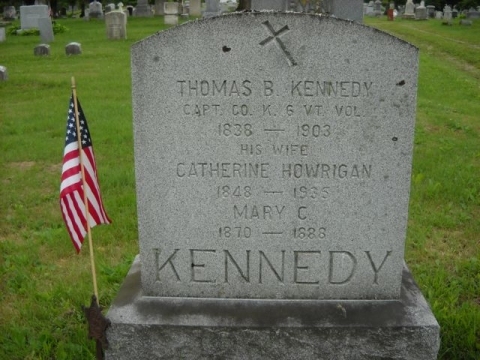 He was born August 20, 1840 to Thomas and Mary Cavenaugh Kennedy. His parents had emigrated to Milton Vermont from Queens County, Ireland in the 1820's. They were among several dozen Irish Catholic families who settled in Franklin County, VT prior to the Irish potato famines of the 1840's. In mid 1861, when it became evident that the civil war would last much longer than originally thought, Abraham Lincoln issued a national call for 500,000 men to volunteer for three years of service in the Union Army. Thomas Kennedy was one of 6,300 young Vermonters to answer the call that summer and fall, when five infantry regiments from the State were mustered into service. Twenty-six thousand more Vermonters followed in the ensuing three years. By the end of the war, fifty percent of the eligible men in Vermont had fought in it. Enlistment records show that Kennedy was 21 years old when he enlisted, was 5 feet 8 inches tall, with light complexion, sandy hair and blue eyes, and was a farmer. In State records, he was "credited" as a volunteer from Sheldon, although he was born in Milton and was living there at the time of enlistment. An older brother Edward, living in Massachusetts, enlisted in the 33rd Mass. Infantry in July 1862 and was wounded during Sherman's march toward Atlanta. Military Service: Thomas Kennedy enlisted as a private on October 15, 1861 in Montpelier. He was enrolled in Company K of the Vermont 6th infantry regiment. The regiment of 970 men left Vermont on October 19, arriving a few days later at Camp Casey on Washington D.C.'s Capitol Hill, and then marched to Camp Griffin, Virginia (current site of the CIA) on October 24. They remained at this camp for 5 months, undergoing training, sentry duty, and assisting the 2nd Regiment in felling trees, constructing, and manning fortifications being hastily placed around the perimeter of Washington, D.C. One of the installations, in northern Virginia, was named Fort Ethan Allen. Another, in D.C., was Battery Vermont, placed on a site (now Sibley Hospital) to guard the Chain Bridge approach to D.C. over the Potomac River from Virginia. The Vermont 6th infantry was one of five regiments comprising the 1st Vermont Brigade, which during most of its service was attached to the U.S. Army VI Corps as the 2nd Brigade of the 2nd (Getty's) Division. The regiment was engaged in many maneuvers, battles and skirmishes in Northern Virginia (Peninsula, Chancellorsville, Wilderness, Petersburg and Shenandoah Valley campaigns), and at Antietam and Funkstown in Maryland. This regiment was one of only 45 out of 2000 regiments to lose more than 200 men in battle. Kennedy's Co. K suffered casualties in 20 battles over 3 ½ years. Kennedy was promoted progressively from private to sergeant by the end of 1862. He was promoted to 2nd Lieutenant on March 18, 1863, to 1st Lieutenant on February 11, 1864 and Captain on September 19, 1864. He was seriously wounded in the upper left leg at the Battle of Cedar Creek, Virginia on October 19, 1864, exactly three years from the day he had left Vermont. He was taken to a field hospital in Winchester VA, then to an army hospital in Frederick MD on Dec. 14 and to Officer's General Hospital in Annapolis on Dec. 17. Given the high rate of mortality from infections following surgery, it is fortunate that the regimental surgeon decided not to operate, but to leave the bullet in his leg. On January 7, 1865 he was sent home to Vermont for recuperation. He was honorably discharged "for wounds" in April 1865. For the rest of his life, minie-ball that struck him remained lodged in his upper thigh. The 6th regiment was in frequent movement or in skirmishes/battle engagements throughout the war except for weather-imposed lulls during winter. Over the three years of Kennedy's active service, the regiment walked over 1000 miles across fields, marshes, and mountain gaps, and on dirt roads that were muddy in spring and hot and dust-choked in summer. In addition, they traveled hundreds of miles by train, ship and river barge as they were transported from one theater of action to another, mostly in Virginia and Maryland. Kennedy's only absence from duty noted in his service record is a 30-day furlough in January, 1864, a War Department bonus to men who agreed, in advance, to re-enlist when their original 3-year period was due to expire (for Kennedy, Oct 15, 1864). Over the course of the war, there were 13 engagements (20 days) in which a total of 82 men from Co. K were wounded or killed, a casualty rate of 47% (roster of 175 men over four years). The company's heaviest casualties occurred at Savage Station, the Wilderness, and Cedar Creek, all in Virginia, and at Funkstown MD. In addition, as in most civil war units, more soldiers died from illness and disease than from battle wounds. Over the course of the war, the State of Vermont lost 1830 men from battle-inflicted wounds, and 3300 from disease. The 6th regiment lost 203 and 215 respectively. In August of 1863, after participating in the Chancellorsville and Gettysburg campaigns, the Vermont Brigade was pulled out of Virginia and was sent by ship to New York City to help maintain order during re-imposition of the military draft that had precipitated the now-infamous "Irish" draft riots. On the voyage to New York, a major catastrophe was narrowly averted when the brigade's steamship (the Illinois) collided with a schooner in Chesapeake Bay; resulting in the drowning of one soldier. In July of 1864 the brigade was withdrawn from the Petersburg Campaign to help defend Washington D.C. from an attack by Jubal Early's Confederate army expected from the north through Montgomery County MD. The city was vulnerable because its perimeter forts were at that time lightly staffed with injured soldiers, local militia, and government clerks. After landing at the Maine Avenue waterfront, the Vermont brigade quickly marched up Seventh Street (then a dirt street) through the city's downtown, out to Fort Stevens. The brigade backed up other units who successfully repulsed the attack. The battle was unique because it was the only one ever witnessed on-site by a President (Lincoln narrowly missed being hit). The Vermont brigade secured the fort at night after the battle, and then for several days pursued Early's retreating army through Montgomery County and into Virginia. The Battle of Cedar Creek: Kennedy's luck in avoiding injury ran out on October 19, 1864. This battle, in Virginia's Shenandoah Valley, was a pivotal event that finally ended the threat of repeated Confederate incursions into Maryland and Pennsylvania. It was one of two Union victories that Fall that salvaged Lincoln's pessimistic hopes for re-election. The battle was an apparent Confederate victory starting from Jubal Early's surprise attack at 5:00 am until Union forces counter-attacked at 4:00 pm and routed the Confederates after nightfall. It had been preceded by a month-long Union burning of over 2000 barns filled with the summer harvest of this fertile valley, the "breadbasket of the Confederacy." Union troops also destroyed over 70 mills and confiscated over 4000 livestock to deprive southern armies of vital food supplies. The sweep of destruction in the 90-mile-long valley can be imagined by considering a comparable distance of Vermont's Champlain Valley from Rutland to the Canadian border. As a young farmer, Kennedy might well have had private thoughts of what lay ahead for Shenandoah Valley residents as winter approached. On October 19, that point was brought home to him by a local resident who accosted him as he lay wounded on the field of battle (from a letter Kennedy wrote in 1872). 'The 18th of October in the Shenandoah Valley was such a day as few have seen who have not spent an autumn in Virginia: crisp and bright and still in the morning; mellow and golden and still at noon; crimson and glorious and still at the sun setting; just blue enough in the distance to soften without obscuring the outline of the mountains; just hazy enough to render the atmosphere visible without limiting the range of sight. As evening closed above the valley, the soft pleadings of some homesick soldier's flute floated out through the quiet camp. Kennedy was wounded in the early morning from a minie ball that struck him in the left thigh near the hip, ending his service for the remaining 6 months of the war. The circumstances of his injury and his company's role in the battle are noted in the 1872 letter and transcription notes attached. Out of approximately 60 "fit-for-duty" men in Kennedy's combined Company E/K that day, four were killed (three from one town, Franklin VT), nine were wounded, and two were taken prisoner. After the War: After Kennedy was honorably discharged in 1865, he resumed civilian life in Vermont. In 1869 he settled in Fairfield as "a merchant" and in January 1870 he married Catherine Howrigan (a family since prominent in Vermont Democratic circles for over 100 years). He was 29, she was 21. Despite his disability, they had 9 children and he led an active life in various elective and political events until his death in 1903. Kennedy was especially active politically in the 1870s, during which time he served two terms in the State legislature, preceded by terms as a Town Selectman, constable and collector, and superintendent of the town's one-room schools. In the 1880's he served four years as Sheriff of Franklin County. In 1870 the Vermont legislature commissioned the Vermont-born artist and civil war veteran (and 2nd youngest-ever Congressional Medal of Honor awardee) Julian Scott for a suitable painting to honor Vermonters' valor in the war. After input from Vermont veterans, Scott decided to use Cedar Creek as the subject, reflecting the fact that more Vermont units were engaged in that battle than in any other battle, and that all units had sustained heavy casualties there. Since its completion in 1874, the 10x20-foot painting has hung in the Executive wing of the State Capitol. Kennedy is one of 21 officers (one of only four below the rank of Major) whose likenesses are portrayed in the painting. Prominently positioned near the center foreground, being carried off the field of battle, he is recognizable in his red hair (a family trait) and a red beard. Scott may have felt an affinity for Kennedy and placed him in the center of the painting since he too had (reportedly) suffered a hip wound in the war (battle of White Oak). Or, another factor might have been that in the early 1870s Kennedy could have been considered a "rising star" in Vermont, in a position to influence future commissions for the young artist. In the course of conducting research for the painting, Julian Scott corresponded with many veterans, requesting portrait photos and descriptions of their part in the battle. Scott and Kennedy exchanged letters (attached) in which Kennedy graphically described his Company's part in the battle, how he was wounded, and his encounter with the local Virginia resident. In 1876, Kennedy was selected as a delegate to the 1876 Democratic National Convention in St. Louis. The convention, supported by all 10 Vermont delegates, nominated Samuel Tilden (former governor of New York) for president in what proved to be a very controversial election that changed the course of history for millions of Americans. Although Tilden won the popular vote in the election, his Republican opponent Rutherford B. Hayes was elected president. (Hayes, like Kennedy, had been a Union officer at Cedar Creek.) The election was so convoluted that selection of the president was not resolved until two days before inauguration day. Hayes' election occurred from a "deal" offered by some southern Democrats. To broker a favorable electoral vote, a special commission of House, Senate and Supreme Court representatives was created, with the ultimate result that some state delegations (Democrats) to the Electoral College were unseated, giving the election to Hayes. The deal that was struck was based on assurances that Hayes would not overturn an action proposed by southern congressmen that his lame-duck predecessor (Ulysses S. Grant) end "reconstruction" in the south by withdrawing federal troops still occupying some states. That withdrawal effectively suspended, for the next ninety years, federal efforts to ensure the rights of black Americans in the south. In 1878 or 79, Kennedy and his family went to California, presumably to "seek his fortune." A brother, uncle, and cousin of Catherine's lived in Sacramento. For reasons unknown, the family returned to Vermont shortly thereafter. In 1886, Kennedy was appointed to represent the former 6th regiment (part of the 1st Vermont Brigade) on a special Commission to erect monuments to Vermont units on the Gettysburg battlefield. One of five Vermont monuments dedicated at Gettysburg in 1889 was the 1st Brigade's, depicted as a reclining but snarling lion. The dedication booklet notes the symbolism that although the brigade was not actively engaged, (it protected the Union's left flank but was not threatened) it played a vital role by being prepared to spring into action "like a lion in his [the enemy's] path." Although the 1st Brigade was not engaged at Gettysburg, it had force-marched overnight for 18 hours from Manchester MD, 35 miles away, in very hot weather, to reach Gettysburg on the second day of battle. The Vermont 2nd Brigade and Cavalry played active parts in that battle. Little is known of Kennedy's later years. A business directory in 1883 lists a Thomas B. Kennedy of Swanton as the owner of several farms. He was elected Sheriff of Franklin County in 1884 and 1886, serving for four years. During this period his widowed mother and his first-born child (Mary) died. In 1889 Kennedy fell beneath the wheels of a streetcar in St. Albans and lost his left hand. This accident was a severe blow to the family which then consisted of seven children between the ages of 3 and 17. In 1891 the last child (Harold) was born. On November 9, 1903, at age 63, Thomas Kennedy died suddenly in St. Albans of an apparent blot clot from the area of his war wound. His wife Catherine survived him until 1935 at age 87. Both are buried in Holy Cross Cemetery in St. Albans. Of the eight children who grew to adulthood, their professions included teaching, accounting, horticulture, medicine, and postmaster. Out of 45 direct descendants of Thomas and Catherine Kennedy, 19 are still living. Personal Postscript: In Thomas Kennedy's pivotal year of 1864, his sister Ellen (1834-1873) married Patrick Ryan of Fairfield, Vermont, great-grandfather of Patricia (Ryan) Daniel, making Thomas Kennedy her great-grand-uncle. In 1940, 100 years after Kennedy's birth, his son Harold was a pallbearer at the funeral, in St. Albans, of Francis Ryan who was the son of Patrick Ryan and the father of Patricia. The Daniel's currently live in Rockville, Montgomery County, MD, five miles from the road (River Road) that Kennedy and his regiment followed as they marched northward pursuing Jubal Early's Confederate forces after their 1864 attack on Fort Stevens. Today, at White's Ferry on the Potomac River, where both armies passed from Montgomery County into Loudon County Virginia, the small ferry that shuttles commuters and tourists across the river is named "The Jubal Early." The bucolic scene at White's Ferry today is a sharp contrast to the suffering and conflict that tore the nation apart 140 years ago. Acknowledgements: Sue Honore, Emerson Melaven, Ed Italo, Michael King, Tom Ledoux, Robert Titterton (biographer of Julian Scott), and Civil War Medicine Museum. from Julian Scott (artist of the painting "The Battle of Cedar Creek"
In order to more thoroughly perfect the historical picture I am painting for the State of Vermont, the subject of which is the Battle of Cedar Creek, I desire to get from you your photograph and a knowledge of the nature of your wound - that is its locality and at what time in the engagement you received it, also any incidents you can give me, if it is not too much trouble, you may know of. You necessarily understand that to make a painting of the kind I hope to, an immense amount of material must be obtained, therefore I do not hesitate to ask any of the soldiers of the "Old Brigade" who were in the fight before mentioned, to send me their pictures and such accounts of the battle they may remember. If there are any men in your locality who may have served under you or with you, you would confer a great favor not only upon me but on them and the State, to solicit for me such aid of them as I have asked of you. Trusting to hear from you soon, I remain very truely yours. Transcript of letter from Capt. Thomas B. Kennedy, 6th VT inf., to artist Julian Scott, painter of "The Battle of Cedar Creek," in reply to a 12/25/1871 request for information about his battle wounds/circumstances to lend accuracy to the painting. Kennedy is portrayed, in red beard and red hair, in the center foreground of the painting, as identified in the artist's composition notes. Punctuation and quotation marks have been added for clarity. Dear SirYour favor of a recent date is at hand. In reply, that day I was in command of Companies K and E at the Battle of Cedar Creek. I was on the right of the Reg't. We were deployed as skirmishers. The morning was very foggy. Could not distinguish our men from the Rebs at a distance of ten rods. When I discovered that the Rebs were right upon us I assembled my companies and sheltered ourselves behind a stone wall. I then found that the remainder of my Reg't had fallen back. I saw at a short distance from me several pieces of artillery, which I thought our troops were trying to save. Commenced proceeding towards it when a short distance from artillery was hit by a minnie ball breaking my left hip, the ball lodging in my groin where it now remains. The first troops that came up to me took my hat, corps badge and all of the contents of my pockets. I remained on the field until about 9PM. While on the field a citizen came up to where the artillery which I mentioned and commenced to taking straps of different kinds. A Reb officer asked him why he was taking them. He replied that the Yankees had stripped him of all he possessed. "And this," said he, "is one of the happiest days of my life. There," [referring to the wounded Kennedy] said he, "is one that is used up," striking me at the same time with his fist. Then, said he, "I wish to God I could see them all in the same fix." He was a man who professed loyalty to the Union, to us, and whose property we had guarded. I enclose my photo. If rec'd all right please acknowledge receipt and oblige. Kennedy had been a member of Co. K since his enlistment as a private in 1861, and had been promoted through the ranks to Captain by Oct, 1864. On October 16, three days before the battle, several companies of the regiment were combined (including E into K) because many of the original 3-year enlistees still remaining, comprising ¼ of the regiment by that date, decided not to re-enlist. Kennedy was one of the officers who chose to re-enlist; 12 officers of the regiment did not. At approx. 8:00am, the 1st Vermont brigade, part of the Second (Getty's) Division of the VI Army Corps, was deployed on an open plain between the Valley Pike (now US 11) and a County road to stem the Confederate advance after their successful pre-dawn surprise attack on VIII Corps troops. Getty's forces fell back after initial skirmishes. Ten rods visibility is equivalent to 160 feet. Union troops were at a disadvantage when the fog began to clear since they faced the rising sun low in the sky, obscuring their view of the opposing forces. Kennedy indicates that the bullet that broke his hip remained lodged in his groin; Army hospital records state that it lodged near the trochanter major, a muscle in the rear of the upper thigh. The bullet remained there for the rest of his life. The rescue of Kennedy from the battlefield at 9 pm is consistent with the time Union forces retook the areas from which they had retreated in the morning. One can only imagine the wounded's concern as they lay unattended all day, for 12 hours, into the darkness, not knowing when they would be picked up, and by which army. The citizen "whose property we had guarded" might have been the owner of the farm (now a quarry in 2002) where Vermont regiments had bivouaced since Oct 10. The owner's house was still standing at the time of the battle but the farm buildings were most likely destroyed and the livestock driven away by Union forces earlier that month during the Shenandoah Valley "burning." It is hard to imagine there would have been Union sympathizers in the Valley, as Union troops in September/October had decimated valley farms and fields for 90 miles to deprive Confederate armies of food supplies. The most likely explanation for the apparent contradiction in the citizen's allegiances is that in order to save his house he probably told bivouacking troops that he was a Union supporter. Since his encounter with Kennedy occurred after Confederate forces had pushed back the Union armies three miles from their camps in apparent victory, the citizen would have felt safe in revealing his true feelings. Footnote: An interesting sidelight to Julian Scott's painting as described in Bob Titterton's bio of Scott and his work, is that the Vermont legislature balked at paying Scott the amount he billed for the painting; it was almost twice the original commission amount authorized. Painting Kennedy into the center foreground of the scene may have been part of Scott's problem in getting paid, since by the time the bill for the painting was submitted, Kennedy was a newly-elected Democrat in a Republican-dominated legislature. There probably were some Republicans who may have been miffed either because Kennedy was in the painting, or because his face was more prominent in the scene than some higher-ranking officers who might have been Republicans. As Titterton describes it, after much debate in the legislature Scott eventually got paid, but it was an amount closer to the original figure than to the amount he billed. So much for receiving the Congressional Medal of Honor for saving Vermont soldiers lives!! To the best of my knowledge, he never did a painting again for the State of Vermont. Edward Daniel. Claim submitted Dec 24, 1889 for pension increase due to loss of left hand when Kennedy lost his balance and his hand slipped under the wheel of a streetcar. Claim was denied. Claim re-submitted April 1890. Affidavits were submitted from 6th regiment veterans David Burns of Fairfield and George W. Burleson of St. Albans, both of whom knew Kennedy from childhood and were with him at the Battle of Cedar Creek. Burns stated that he helped carry Kennedy off the field of battle. Burleson stated that he and Kennedy were tent mates during part of the war, and that he saw Kennedy in the Army hospital in Winchester VA after the battle. He noted the loss of Kennedy's hand as further worsening his disability. Medical exam on April 22, 1891 detailed Kennedy's condition: 180lbs, hgt 5 feet 8 inches, L leg 3" shorter than R leg; hip muscles atrophied, loss of control of left foot has contributed to several falls, including the one that resulted in loss of left hand. Medical exam on Dec 2 1891 noted worsening of conditions. In Feb 1892, retroactive to April 22, 1891, pension was finally increased, but only to $24/month. On Nov 9, 1903, at around 9-9: 30 pm; Kennedy died suddenly on Lake Street in St. Albans. Responding physician later noted (affidavit attached) that death was instantaneous, caused by an embolism that originated in the area of the hip wound and traveled to the heart. Since Thomas' death certificate stated "heart disease" as cause of death, Catherine's initial pension application was denied, citing that "disease of the heart is not due to [the war-caused] disability." On Dec 27, 1904 through Atty. Thomas E. Perkins, Catherine requested re-opening of the application. Affidavits were provided from Dr. Sherwood (the family's doctor) and a Dr. Berkley that an embolism due to a thrombus from the war wound floated to the heart and caused instant death, and that therefore his death was war-related. The pension was finally approved effective Mar 27, 1905. Her pension was set at $8/month, plus $2/month until their son Harold G. Kennedy would reach the age of 16 (Sept 22, 1907). In January 1906, Catherine's neighbors Barney F. Kelley and John H. Ryan submitted an affidavit, apparently in support of a request for a higher pension level. They stated that they were "familiar with his [Kennedy's] financial affairs�that he met with financial losses and at the time of his death he had no property and had for some years been dependant on his pension and the kindness of relatives and friends�"
Federal pensions gradually increased over the years to account for inflation. Effective June 4, 1928, Catherine's pension was increased to $40/month. It remained at this level until her death in 1935. Transcripts of various affidavits are attached. Medical Findings: "Upon examination we find the following objective conditions: Pulse rate 84; respiration 20; temp 98.5; hgt 5 ft 8 in. ; weight 180 pounds; age 50 years." "G.S.W. [gun shot wound] of left thigh. Ball [the bullet] entered the hip about two inches below and two inches posterior to great trochanter causing a fracture of upper third of shaft of femur, leaving a deep firmly adherent scar from sloughing. Ball is still within the hip, all the muscles of hip are atrophied. Left leg is three inches smaller at junction of middle and upper third than the right, and leg is two inches shorter. Can stand with the foot resting on the ground in a natural position, but when raised the foot turns outwards showing a paralyzed condition or injury to abductor muscles. There is also a loss of power to flex the thigh upon the body. If this man trips his foot in walking he is unable to use the leg sufficiently to save himself and he has received two or three injuries by falling. [Additional comments on reverse side of form were not transcribed, but are to the effect that the loss of his left hand from a streetcar accident was caused by a fall due to instability of the wounded leg and hip] He is, in our opinion, entitled to a 2nd grade rating for the disability caused by the G.S. W. of left thigh, and 3rd grade rating for that caused by loss of left hand." BY: R. Sherwood, Pres. H.D. Bellows, Sec'y. R. E. Welch, Treas. "He [claimant] makes the flowing statement upon which he bases his claim for increase: Thigh worse. Is uncertain in walking and on going up stairs. Hip very painful. Can't walk in snow or on rough walks. Often falls. On account of condition of hip fell 2 years ago and lost left hand, by car [streetcar] running over same. Alleges much sciatica." Medical Findings: "Upon examination we find the flowing objective conditions: Pulse rate 112; respiration 33; temp 98.4; hgt 5 ft 8 in. ; weight 170 pounds; age 51 years." "G.S.W. left thigh. Scar outer surface thigh in axillary [illegible], exactly 8 inches below crest of illium, 1� inch long and � inch in breadth, depressed adhered and badly dragging. Much loss of tissue beneath scar. Scar very tender. One inch below above is another scar � inch in diameter, alleged to be scar of an abscess. Left gluteal [sic] muscles atrophied. Left-thigh below gluteal [sic] fold measures 1� inches, and above ___ � inch less than right. Left calf � inch less than right. Both legs same length but left side of pelvis is tilted in walking and so that there is apparent shortening of leg. Limb is used in walking and supports body when taking steps with other foot. Flexor, extender and abductor lessened 1/3 or more. As he stands left foot is averted to angle of 50 degrees or more to normal line of foot. Rotation of hip limited. Uses no cane or crutch but did use cane before losing left hand. In walking, takes short step with left leg by raising other foot and flexing knee. Left forearm amputated 1� inches above the distal end ulna. Good stump, well healed, and scar not tender. In our opinion disability from g.s.w. thigh is equivalent to loss of hand or foot. Loss of hand increases disability in thigh. He is, in our opinion, entitled to a $24 rating [pension benefit; reviewers did not use "rating class" normally referenced] for the disability caused by g.s.w. left thigh. 30/30 for that caused by loss of left hand." BY: L.M. Bingham, Pres. D.C. Hawley, Sec'y. W.H Varney, Treas. A statement that "he is a practicing physician that had been acquainted with Thomas B. Kennedy for two years, and that he [the doctor] was called to attend claimant Thomas B. Kennedy at his death. When affiant arrived he found above Thos. B. Kennedy dead and warm. Affiant learned from those present at Kennedy's death, which occurred but a few minutes before the arrival of the affiant, that afsd Kennedy was sitting visiting with some friends and suddenly grasped his heart, grew pale and groaned as if in pain. Some one hastened to him, but he never breathed again and was apparently dead." "Judging from the above statements, and after discussing the case with his (aka Kennedy) family physician Dr. Ralph Sherwood, and learning that he had never had any heart trouble but was suffering from an inflammatory condition of his hip in the seat of an old gun shot wound, affiant is of the opinion that Thomas B. Kennedy died of embolism of heart arising from thrombosis of diseased hip." "We were acquainted with the late Thomas B. Kennedy for many years prior to his death; that we lived in the same town and city with him and neighbors to him and were familiar with his financial affairs as neighbors; that we knew from our relations with him that he met with financial losses and at the time of his death he had no property and had for some years been dependant on his pension and the kindness of relatives and friends; he had no real estate at the time of his death. We know his widow, the claimant has not real estate or other property except her clothing and household furniture and has to rely on her own personal labor alone for her support." BY: Barney F. Kelley (age 58) and John H. Ryan (age 69), residents of St. Albans VT.
Capt. Thomas B. Kennedy died suddenly of heart disease at 9:20 o'clock last evening. He had been in his usual good health and was on Lake st. when he became ill and was taken into a pool room where he died before a physician could reach him. The funeral will be held at St. Mary's church Thursday morning at 9 o'clock. Thomas B. Kennedy was born in Sheldon in 1840. He was a veteran of the Civil War, having enlisted in Co. K, 6th Regt., he was appointed sergeant in `862, second lieutenant Feb. 11, 1864, and captain Sept. 19, 1864. He was honorably discharged April 25, 1865, for wounds received in action at Cedar Creek, Va., Oct, 19, 1864. In politics Captain Kennedy a firm Democrat, and was elected sheriff of Franklin county in 1884 and 1886, serving four years. He leaves beside his wife eight children, Misses Louis M., Charlotte M., Florence E., Thomas W., Edward A., and Harold G. Kennedy, of this city, James E. Kennedy of Montpelier, and Charles A. Kennedy, of Newport, R.I.